Tomorrow we go to the polls in the most important election of our lifetimes. If that seems an overstatement, the following should erase any doubt. RealClearPolitics has the race essentially tied, with Obama leading by a hair. My favorite political guru -- Michael Barone -- has predicted a mini-landslide for Romney. Whatever the result may be, the stakes could not be higher. Barack Obama's presidency has been totally partisan and intensely ideological. He has pushed everything he could touch radically leftward, changing America's course and the world's. If he is re-elected, that push will continue so effectively that whoever succeeds him in 2017 will discover that most of the damage done is irreparable. Consider just a few of the most important issues that the president -- be it Obama or Romney -- will decide. 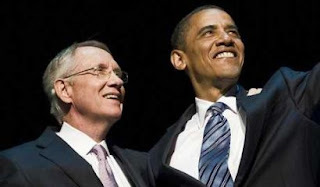 Last week, Mad Dog Harry Reid (D-Nev.), the Senate Majority Leader, said that it was "laughable" to think that liberal Senate Dems would work with a president Romney. Unless the Republicans take the Senate, nothing a President Romney offers will even come to a vote unless Romney can find a way around Reid. "Bipartisanship" is as easily corralled as a unicorn.